This is an abridged verion of the 2-Lp set 30th Anniversary on Stage. Two tracks were cut for the CD issue: "Send in The Clowns" and "El Cumbanchero." Remixed by: Scott Smith/Dave Brock, Chapman Studios, Kansas City, Mo. Design & Art Direction: Debbie Wright, Tama Cummins, John Muller & Co., Kansas City, Mo. Cover Photography: Ralph Dailey, Los Angeles, Ca. The emotional energy that fires Arthur Ferrante & Louis Teicher’s live appearances all over the country flows freely on this eclectic double recording. The appeal of the melodies is wide-ranging… from Broadway to the movies; form the pop scene to the classics; from the traditional to a little Latin spice. 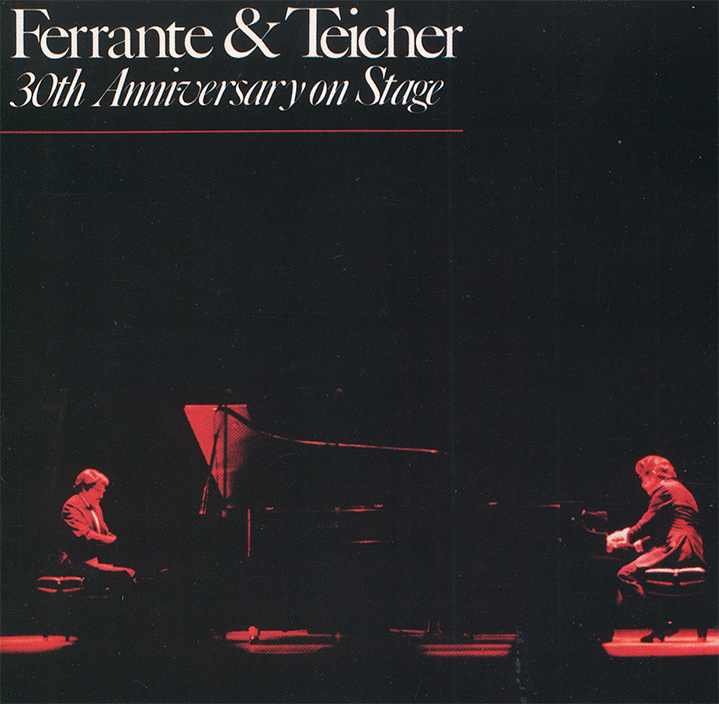 30th ANNIVERSARY ON STAGE celebrates Ferrante & Teicher’s inimitable, award-winning style of creating dynamic orchestral arrangements to turn the classics into standards and the standards into classics. The CD version of 30th Anniversary on Stage does not include "Send in The Clowns" or "El Cumbanchero." The CD leaflet does not include the inside photography of the gatefold cover of the 2-Lp set. The 80s recording of "Send in The Clowns" can be found on The Ferrante & Teicher Collection; "El Cumbanchero" on 40th Anniversary.